Samsung make lots of android phones covering almost every bracket of the market, whether you like this strategy or not thereâ€™s no denying it works. 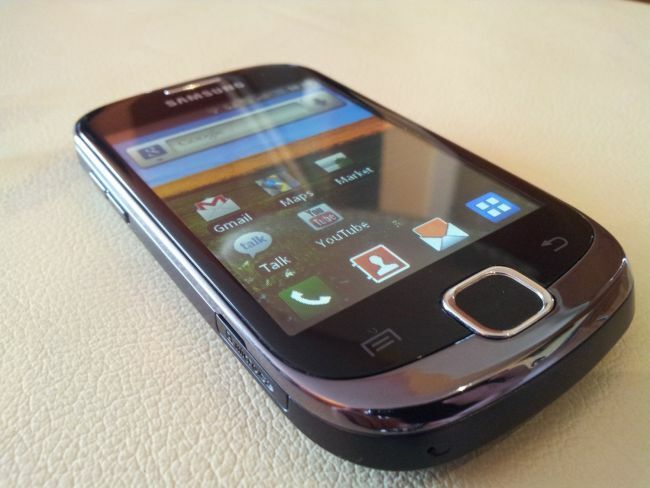 News recently broke that Samsung has now overtaken Nokia as the biggest seller of mobile phones on the planet. Samsung has named its android smartphone range as the Galaxy range, which includes the very top high-end phones all the way down to their entry level phones. The Galaxy Fit â€˜fitsâ€™ into the latter category. Unashamedly a budget phone, the Galaxy Fit looks to improve upon its predecessor the Galaxy Mini. Weâ€™ll let you know if this phone is better suited to taking your money than other budget phones (like the HTC Wildfire S). The phone is a good weight and feels nice in the hand, those who like their phones on the smaller side will be especially pleased on this front. I have fairly big hands and this phone easily fits into the palm of my hand. The Fit has a lot of curves as you tend to see in most phones this size. It actually looks quite nice, the front and back of the phone are really well constructed, and although made of plastic, itâ€™s very sturdy and gives it a sense of being more expensive than it actually is. The front of the phone contains a silver grill housing the earpiece towards the top, and the capacitive menu and back keys either side of the Samsung favoured physical home button. The home button is a sort of brushed plastic (actually, the same type of brushed texture as the new pebble blue Galaxy SIII), the only thing that lets down the front of the phone is the silver rim around the home button, which adds an element of cheapness that could have been avoided. This phone doesnâ€™t have a front facing camera. The back of the phone contains the 5MP rear camera (no flash unfortunately), the Samsung logo and rear speaker grill towards the bottom. The back casing of the device is made of a textured plastic, it helps to make the phone feel slightly more expensive than it is and also helps to add an extra element of grip. Iâ€™ve found removing the back cover slightly awkward, actually fairly difficult! You have to slide the back off, rather than being able to unclip it. The way it slides follows the direction of the textured grooves on the case so they are no help with getting grip, its possible, just not very easy! The top edge contains the 3.5mm headphone jack and the microUSB port which also contains a hood cover to protect it from dust when not in use. The top left corner also has a lanyard hole, helping us identify the type of people this phone may be aimed towards! 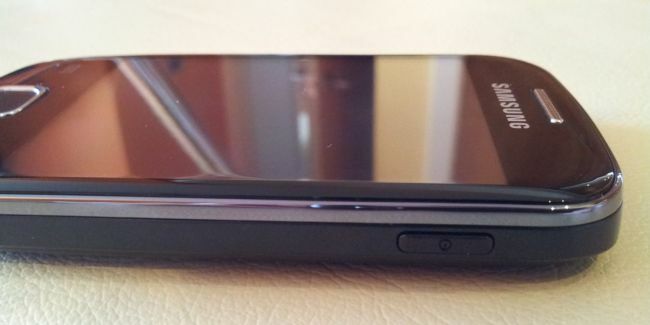 The left hand edge contains the volume rocker and microSD slot. The volume rocker is made of a cheap feeling plastic, but the actual use of it is fine, its easy to find and change the volume. The right hand edge contains the power button, again made of the same cheapish plastic like the volume rocker, but again being perfectly fine to use. One of the biggest let downs of this phone is possibly the screen. Itâ€™s a decent size at 3.3â€, but is really let down by the resolution, which measures in at a measly 240x320. This is exactly the same as the Galaxy Mini, however the slightly larger screen on the Fit means the successor actually has a lower ppi! What this all means is that icons look quite big on the screen, and everything is kind of..blurry.. Nothing appears smoothly when looking at it on this screen. Samsung didnâ€™t include their normal display options on this phone either, things such as changing the display style are lacking which I can only assume are as a result of the quite low quality screen. Considering the low quality, the viewing angles are quite good. We should remember this phone is more likely to be used by a teen who tweets a lot, than someone who needs the very high end, but even so, it lacks in comparison to those phone it is competing against. The Galaxy Fit runs android 2.2.1, a quite out of date version of the android OS. Donâ€™t expect this phone to be updated to anything else either, Samsung just wonâ€™t do it. As a lower end phone aimed at a different target audience, this might not be such a big issue, the type of users this phone is aimed towards probably donâ€™t care what version of android they have. Samsung have included a basic version of Touchwiz on the phone, this is pretty much limited to a new keyboard, and modified core system apps such as Contacts and Messaging. Itâ€™s such a light touch itâ€™s neither here nor there. Iâ€™m sure the reason for the light touch was to ensure the phone wasnâ€™t too overloaded, as the minimal specs might have taken a battering. The Samsung keyboard is a bit fiddly to use on such a small screen, I found myself constantly having to correct myself, thankfully the Fit also comes with Swype keyboard. Using this helped greatly, and if youâ€™re hoping to use this phone primarily as a texting/communication device then Swype should suffice. The autocorrection wasnâ€™t the quickest by any means, but it was accurate. The phone has a 600MHz CPU and 280MB of RAM pushing everything along. You can feel the lack of power when attempting to do intense things such as playing games (Angry Birds stutters occasionally), or when you try and do a few things at the same time, the lack of RAM just canâ€™t deal with too much. The capacitive keys Iâ€™m happy to say are well implemented, both the menu and back keys are extremely responsive. This is something even the ultra high end phones struggle with, so Samsung have done well on this front. The sound coming from the phone wasnâ€™t great, I really wouldnâ€™t bother using this to play music through the loudspeaker, but for calls it was fine. Itâ€™s what you would expect from this kind of price point. I didnâ€™t really expect much from the 5MP rear camera on the Fit, however i was pleasantly surprised! I mean, this wonâ€™t compete with the very high end in mobile phone camera we can find on the likes of the Xperia S, One X or Galaxy SIII... But, itâ€™s not actually that bad. The sample photos I took lacked a bit of colour/contrast, but the detail was much better than expected, especially on close up shots. The detail did lack somewhat when attempting to take more of the scenery in. Moving shots produced adequate performance as well. The lack of flash will be an issue for some people, but for others the good autofocus will make up for it in daylight. Where the photos produced by the camera maybe exceeded my initial expectations, the video this phone gave certainly didnâ€™t. I didnâ€™t have high expectations in all honesty, but not even those were met! The specs say it all really, videos are shot in QVGA at 15fps, and it shows as you can see in the sample video. All in all itâ€™s a decent phone when compared to those at the same price point. The inclusion of swype will be a great addition for those wishing to use it primarily for texting and communicating. Itâ€™ll fall over if you try to do too much at the same time, but that's pretty much the same across the board for a phone this price. If youâ€™re looking to get your hands on your first smartphone, or looking for a cheap android phone for a young teen or older parent this might just be a good choice. Anyone looking or more power will have to save a bit longer and get something slightly more powerful!